Are vultures nobler than vouchers? Both are bird-brained scavengers. There the similarity ends. Vultures feed off the dead. Vouchers feed off public education. Let’s take a closer look at vultures versus vouchers. 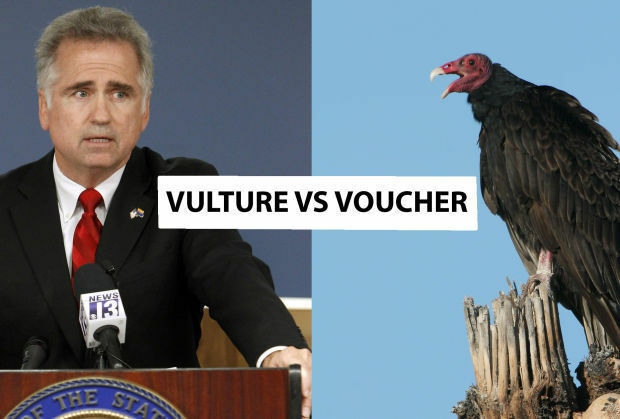 Vultures vs. vouchers: Vultures don’t attack healthy creatures with their sharp bills and talons whereas vouchers have been tearing away at public education for decades. Vultures vs. vouchers: Vultures make a squawking call. Vouchers make robo-calls with a honking “Hupp-Hupp-huppenthal” sound. Vultures vs. vouchers: Did you know that in some parts of the world some vulture species are endangered? Coincidentally, in Arizona, public education is endangered, thanks to vouchers. Vultures vs. vouchers: Vultures will gorge at a carcass and regurgitate food from their crop to feed their young. Vouchers gorge at public school funds and regurgitate the money to feed their backer’s private schools. Vultures vs. vouchers: I was impressed to learn that vultures prevent the spread of diseases by devouring rotting corpses. Vouchers, on the other hand, allow unregulated charter schools to breed and spread, rot and then die, where they are left untended by the state. Continue reading: Vultures versus Vouchers.